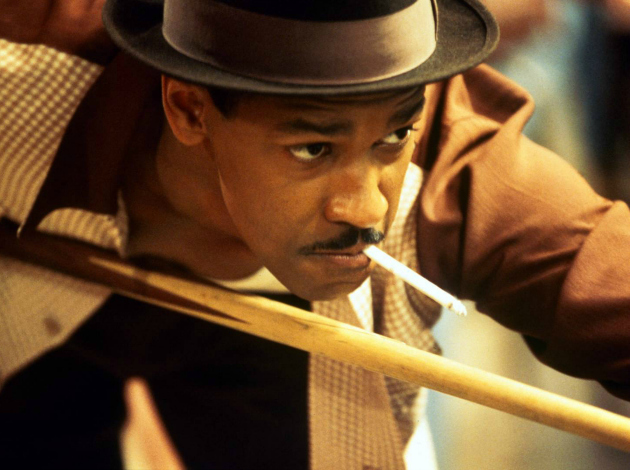 The Essential Denzel Washington | Three Cheers for Darkened Years! Note: This article was penned for CraveOnline, but, thanks to a logistical SNAFU, ended up being done by two authors at once. Rather than let a 3 1/2-page article go to waste, I figured I’d share it with my fan(s) here. Enjoy! This Friday, Denzel Washington’s newest film, The Equalizer, will open in theaters nationwide. This is a terrific time to reassess the man’s awesome career. 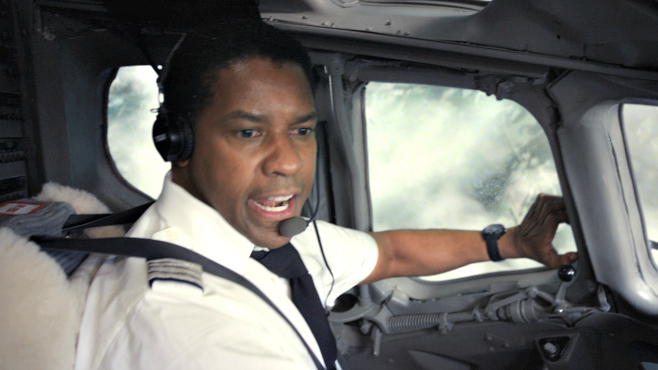 Denzel Washington couldn’t really help but be a movie star. Beyond being a diverse and talented actor, Washington possesses that strangely dazzling and hard-to-define “it” quality that surrounds all movies stars. He’s just appealing to watch, whether he’s playing dark hardasses or smiling benevolent souls. But here’s the thing: Despite his dazzling qualities and his natural charm, Washington doesn’t ever allow himself to coast by on his good looks or affability like. Tom Hanks and Tom Cruise can get away with that. Washington doesn’t want to do that. Indeed, Washington is that rarest of beasts: A Hollywood A-lister who is constantly plays dark. He’s both a movie star and an actor. Looking back over Washington’s career, you do find him in “charming” positions a lot, but more often he’ll be seen as a tortured cop, a prison inmate, or a bitter soldier. There are other actors who often play “dark” and “tortured,” but they’re usually hard-edged and cerebral capital-t-Thespians like Philip Seymour Hoffman or Paul Giamatti. Washington plays dark and tortured within the big-budget Hollywood ethos, rarely making smaller indie films to indulge himself. And it’s that duality that makes Washington so unique. He’s an earthy actor who can only operate in the clouds. He works with auteurs (Robert Zemeckis, Spike Lee, Jonathan Demme, Tony and Ridley Scott), but still frequently makes bold, dumb popcorn entertainments like the amazing Virtuosity or Tony Scott’s fast-paced Unstoppable. If you haven’t seen Washington’s bonkers post-apocalypse movie The Book of Eli, I recommend it. For every virtuoso Washington performance (Malcolm X), he will match with a serviceable (and often clunky and forgettable) actioner like Out of Time or 2 Guns. 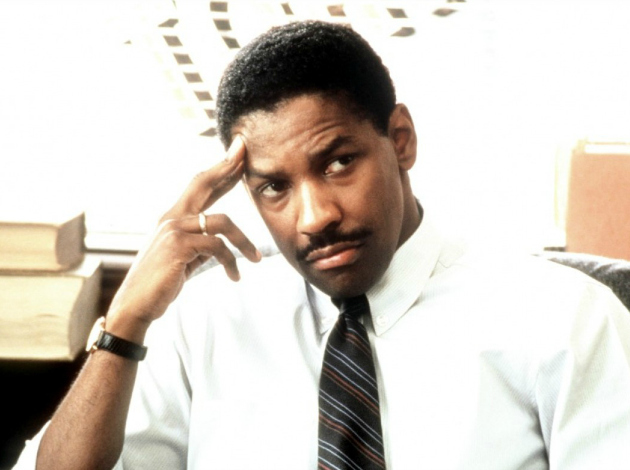 Denzel Washington began his career in his mid-20s, playing bit parts in TV movies and feature films, paying his dues like any self-respecting actor has had to. His big break was playing Dr. Philip Chandler on all 137 episodes of the long-running soap opera “St. Elsewhere.” In 1989, Washington appeared in Edward Zwick’s Civil War film Glory, and essentially exploded into the world of cinema, instantly cementing his status as a classy and reliable movie star. Fluff or heft, Washington was there for you. Washington’s career has been diverse, but I think the following 12 films can exemplify it, acknowledging the highlights of a man who provided us with so much to consider. 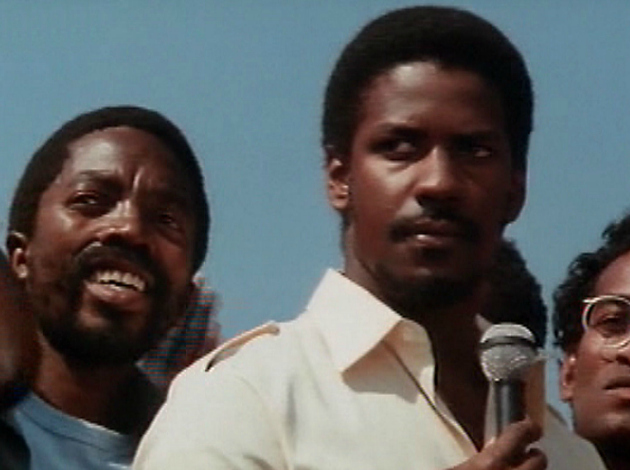 A harsh and violent look about racial struggles in South Africa, Richard Attenborough’s Cry Freedom is confrontational of social ills and injustice. This is not pretend outrage. In it, Denzel Washington plays the real-life anti-apartheid activist Steve Biko who was assassinated under mysterious circumstances. Washington doesn’t appear as an instigator of action in Cry Freedom, but as a dead martyr whose death (and the subsequent cover-up) stood for the horrors of apartheid. It garnered Washington his first Academy Award nomination. A stirring Oscar-bait film of the highest order, Edward Zwick’s Glory tells the true story of Col. Robert Shaw, a Civil War fighter who led the nation’s very first all-black regiment at a time when black people weren’t exactly warmly welcomed into the company of white people. 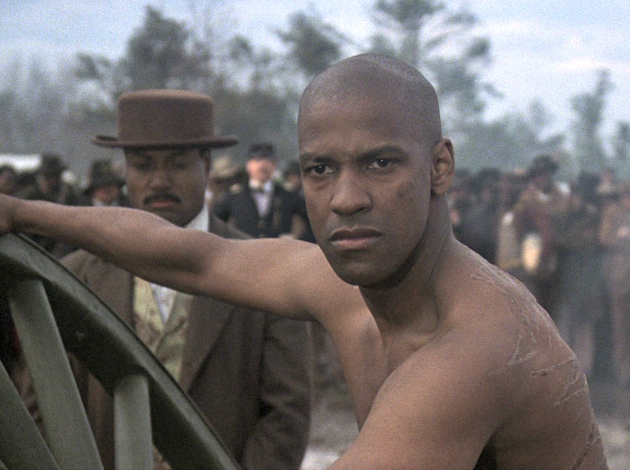 The soldiers are all complex and interesting people, but the face of the black experience was provided by Denzel Washington as Private Trip, an intelligent and decidedly embittered fighter who faces the prejudice around him with strength if not patience. One must fight in order to fight. Washington provides Glory with the vast bulk of his relatable human drama. Washington won an Oscar. A largely ungainly, but nonetheless towering achievement from Spike Lee, Malcolm X spends a casual 202 minutes telling the entire story of the infamous civil rights leader, linking it handily to modern-day racial struggles. In the early 1990s, I recall pundits declaring that racism was pretty much at an end. Lee was there to remind people that it was still present and still a problem. 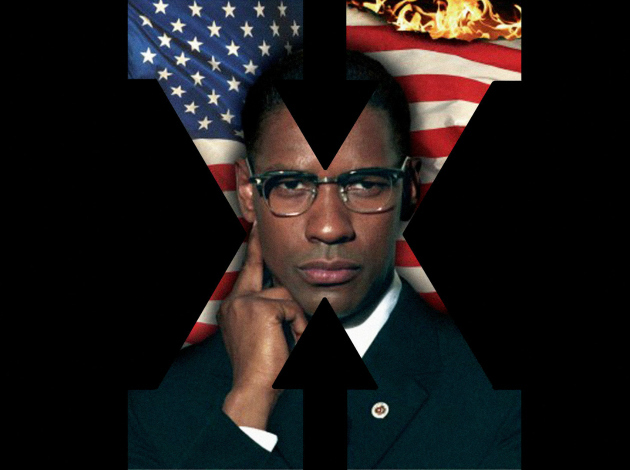 Washington pulls out all the stops as Malcolm X, capturing the contradictions, but more importantly, the anger of the man. It’s possibly Washington’s best performance. He was nominated for an Oscar. 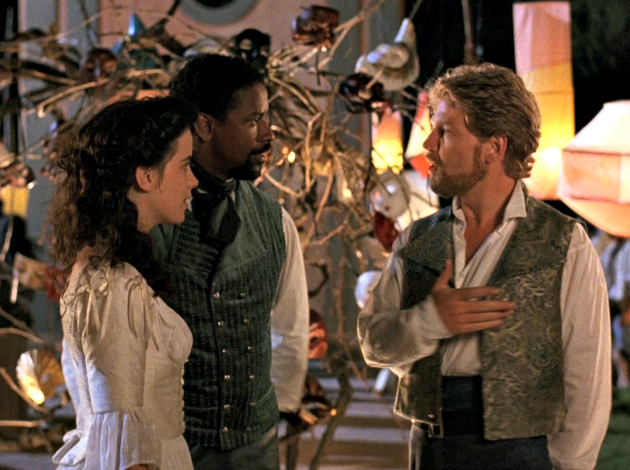 The brilliance of Kenneth Branagh’s lightweight and excellent Much Ado About Nothing, based on Shakespeare’s play, is how the actors are allowed to speak The Bard’s heightened language in their own accents and with their own casual modern lilt. This simple directing choice makes Shakespeare’s poetry undeniably alive. “Much Ado About Nothing” was probably Shakespeare’s most lighthearted play, full of love, charm, songs, and happiness. Washington plays Don Pedro, functionally a supporting character, who commands other characters with the same affable ease he commands the screen. Washington slinks into Shakespeare’s world with a comfort unusual to most American actors. Washington certainly has never shied away from topical films, and Jonathan Demme’s intense Philadelphia is the surest proof. In it, Washington plays a cheap defense lawyer named Joe who has to shoulder the momentous case of defending Andrew Beckett (Tom Hanks) a man who was fired from his job for having AIDS, or perhaps just for being gay. Philadelphia was one of the first mainstream Hollywood films to talk so openly about AIDS and homosexuality, and gain mainstream acceptance from both audiences and from the Academy; Philadelphia was nominated for Best Screenplay and Tom Hanks won Best Actor. Washington was not nominated, but his “are you gay?” rant is certainly a notable moment in the film, as is his “Do I look gay to you?” moment. Based on the book by Walter Moseley, Devil in a Blue Dress is a wicked, smoky noir, perhaps one of the better noirs of the 1990s. I’m genuinely surprised no one has thought to make another Easy Rawlins film after the promise of Devil in a Blue Dress. In it, Washington plays a would-be PI who is hired to find out about a missing woman with ties to local government. Washington turns Easy Rawlins into an affable and more down-to-earth version of Philip Marlowe, baffled by crime, but equal to any task. His scenes with Mouse (the scene-stealing Don Cheadle) make for one of the more interesting criminal dynamics in noir history. Hollywood: Please make another Easy Rawlins and Mouse movie. 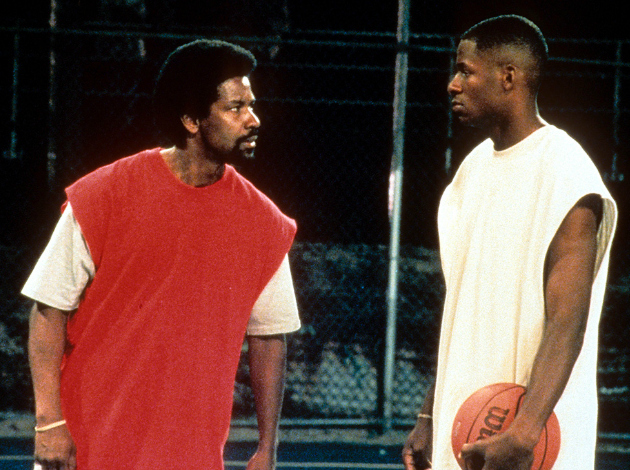 Washington’s second collaboration with Spike Lee is the story of a hopeful basketball star Jesus Shuttlesworth (Ray Allen) who must face down the Mephistophelean temptations presented to him by the moneyed world of college admissions departments (in one scene, Jesus is given a pair of naked white girls as incentive). Washington plays Jesus’ father Jake, a no-nonsense coach-type who insists on good behavior from his son so strongly, the kid can’t help but rebel a little bit. Never mind that Jake is a stirringly moral man, despite the abusive motivation. Jake is a complex character. Lee never lets anyone off the hook easily, and Washington is a master at being on the hook in He Got Game. 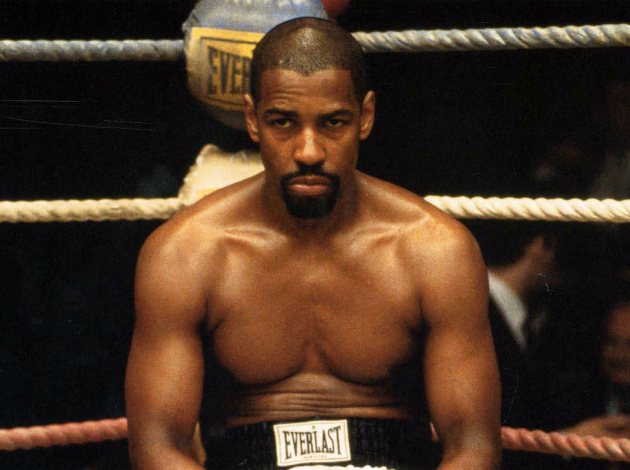 In 1999, Denzel Washington was nominated for yet another Oscar for his performance as the real-life boxer Rubin “Hurricane” Carter in The Hurricane. Carter was infamously arrested for homicide in 1966, and served 19 years in prison, constantly maintaining his innocence, until his final release in 1985. Washington turns Carter into a powerful soul, depicting how wrongful accusation can both destroy a man’s life, but also recreate him as a resolute seeker of justice. Training Day is perhaps an overrated film, shoddily directed, ugly to look at, and painfully nihilistic about the police force in Los Angeles. But what everyone remembers, and the reason anyone’s still talking about Training Day in 2014, is Washington’s viscerally exhilarating performance as Alonzo Harris, L.A.’s most corrupt cop. Alonzo is like a slasher movie villain, only he is actually managing to capture criminals while he indulges in his bad habits. The screenplay is rote, and the action predictable, but Washington transcends, turning his character into a palpable and memorable monster. It earned him his second Oscar. 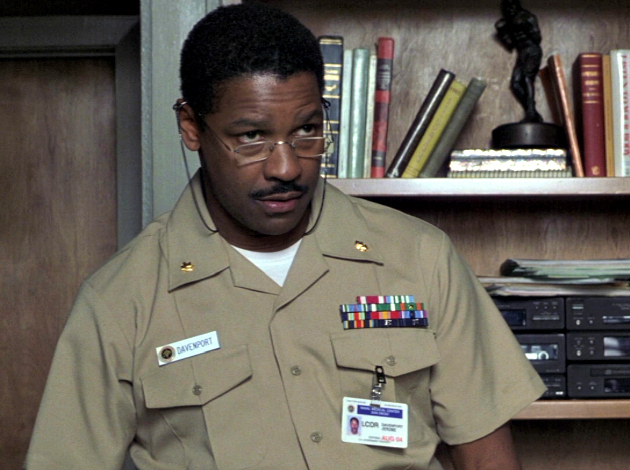 This 2002 tale of a psychologically wounded naval officer and his long road to recovery was Denzel Washington’s directorial debut. Washington cast himself as the heroic shrink who aids the title character (played by Derek Luke) away from sexual trauma and toward a more healthy life. Washington’s performance is subtle and compelling, but more notable is how he allowed Luke and the other cast members to have their own moments to shine. This was not an ego project, but an actor trying to expand his repertoire. Washington proved to be a rich, calming, and sentimental director. He has only directed one more time since. 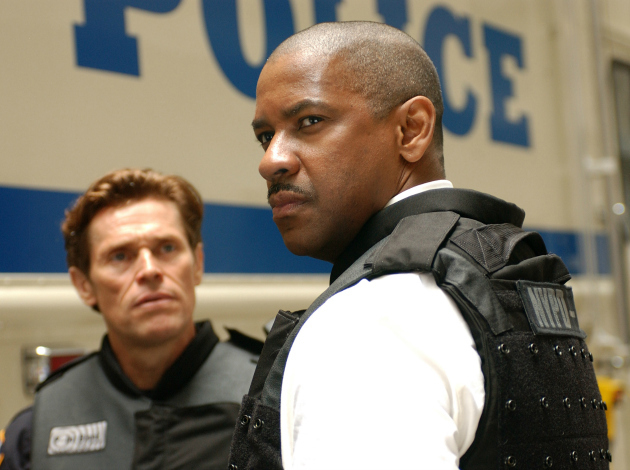 Spike Lee’s third collaboration with Washington (and perhaps Lee’s second most baffling project after his remake of Oldboy), Inside Man is a typical Hollywood potboiler about a complicated bank heist, seen from the simultaneous perspectives of the bank robber, the investigating officer (Washington) and the federal broker trying to control them both. What starts out as a rote thriller, however, quickly becomes a more intriguing analysis of crime, cops, and New York City itself. Lee and Washington can’t help but crack off ambitious material, and even something plain like Inside Man has a note of song thanks to the talents involved. 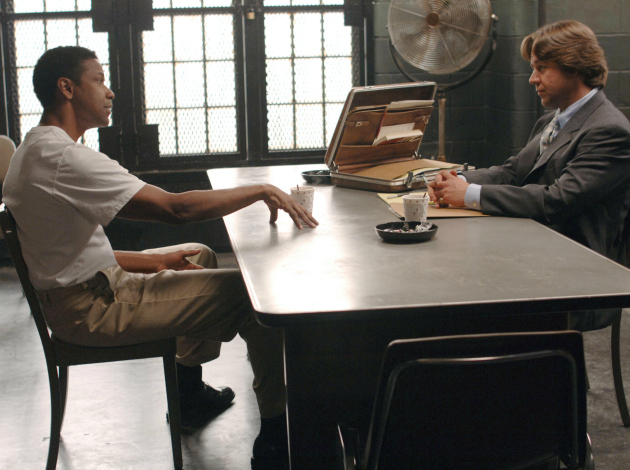 Easily one of Ridley Scott’s best movies, American Gangster once again casts Washington as a dangerous criminal, although he’s never been quite so smooth. Real life heroin giant Frank Lucas ruled Harlem in the 1960s, casually murdering everyone and taking everything he needed to expand his empire. He was amoral, forthright, and, like Tony Montana before him, a blast to hang out with. Washington is so charismatic as Lucas, he practically overshadows Russell Crowe as the hard-working cop hellbent on capturing him. It’s not Washington’s best performance – the real-life Lucas is too cartoonish to come across as anything more than a caricature, even if that is accurate – but it’s most certainly one of his most driven. Garnering Washington his sixth Oscar nomination, Robert Zemeckis smooth and calculating Flight tells the story of an alcoholic pilot who, when drunk on the job, manages to avert a horrible disaster through an amazing feat of flying. The clever inversion of Flight is that an alcoholic’s “low moment” can also be the most heroic thing he’s ever done. Washington has rarely been meatier than in Flight, giving us another charismatic scoundrel, eager to place blame on someone else, desperate to clean up, but not driven enough to outright do either of this things. 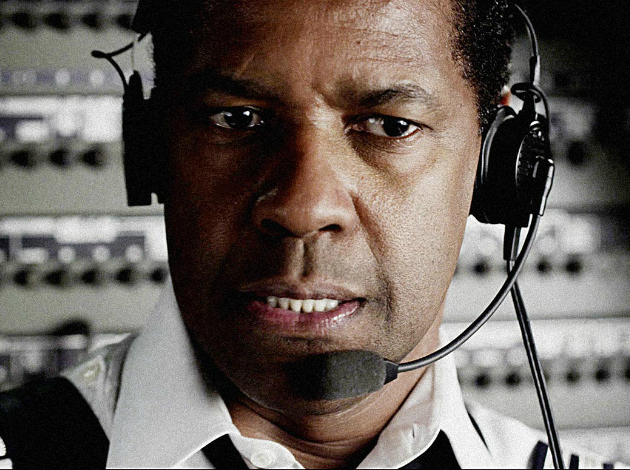 Flight is an excellent addiction tale that hinges entirely on Washington’s amazing performance.